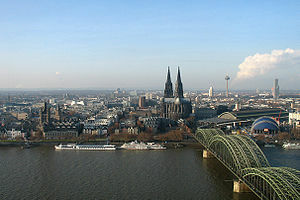 ‘S e mòr-bhaile air an àirde an iar-thuath na Gearmailte a th’ ann an Köln (Kölsch: Kölle, Cuimris: Cwlen, Beurla/Fraingis: Cologne, Duitsis: Keulen, Laideann: Colonia Agrippina). Tha e suidhichte aig 46m os cionn ìre na mara, ri taobh na na h-Aibhne Rhein, faisg air Bonn, anns an sgìre Köln fhèin, 34km air falbh bho Düsseldorf, 222km bho Hamburg agus 478km bho Bherlin, prìomh-bhaile na dùthcha. Chaidh Köln a stèidheachadh ann am 38 R. C. leis na Ubii. Tha 998,105 daoine a’ fuireach anns a’ bhaile., an 4mh baile as motha na dùthcha. Tha Kölsch, dual-chainnt a' bhaile, gu math làidir fhathast. Tha i ga bruidhinn le timcheall air 250,000 neach-labhairt, 's e sin gu bhith ¼ de mhuinntir Khöln. Tha ceangal ann eadar cànan agus cultar a' bhaile, gu h-àraidh aig àm Càrnabhail. Aig an àm seo den bhliadhna cleachdar Kölsch anns na h-òrain is anns na h-òraidean agus cluinnear i anns na sràidean agus aig na fèisean. Tha 11 oilthighean agus colaistean ann an Köln, ach 's e Oilthigh Chologne an t-oilthigh as motha agus aon de na oilthighean as sìne a tha anns a' Ghearmailt. Chaidh a stèidheachadh ann an 1388 aig àm Iompaireachd Naoimh nan Ròmanach. Jacques Offenbach: (1819 – 1880) Cumadair-ciuil. Konrad Adenauer: (1876 – 1977) Ceann-suidhe na Gearmailte eadar 1949 agus 1963. Heinrich Böll: (1917 – 1985) Sgrìobhadair a bhuannaich an Duais Nobel ann an 1972. Carl Bosch: (1972 – 1940) Ceimigear. Air a tharraing à "https://gd.wikipedia.org/w/index.php?title=Köln&oldid=532826"